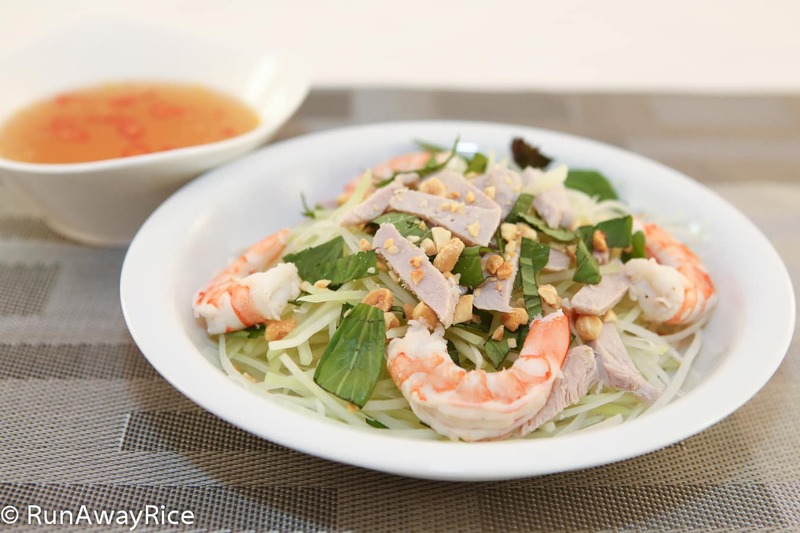 Eating green papaya is a Viet favorite and using it in salads is a wonderful way to enjoy this tasty tropical fruit. Green papaya, like most green fruit, is unripened and not at all sweet. Green papaya has a really interesting texture–crunchy and slightly chewy. I’ve received numerous requests for papaya salad recipes and often wonder which one is being requested so I decided to make both in this week’s feature. The first is a Papaya Salad and Beef Jerky. Whoever thought of adding beef jerky to a salad is a genius. It adds great texture, flavor and the needed protein component to the dish. The salad has fresh Thai basil and is tossed in a savory, slightly sweet Garlic Soy Sauce Dressing. In the video, I mix the Garlic Soy Sauce Dressing with the Papaya Salad and Beef Jerky and in the Papaya Salad with Pork and Shrimp I serve the sauce on the side. I wanted to present two different variations, but I typically like to serve sauces and dressings on the side. Everyone’s palate is different and I’d rather each person add sauces to his or her tastes. If you’re making the salad ahead of time (let’s say for a party or get-together) and wish to dress the salad, wait until you’re ready to serve the dish. The sauce wilts the papaya and fresh herbs quickly and you don’t want to serve a soggy salad to your guests. Most of the time these salads are served in small portions as snacks or appetizers but feel free to heap-on a generous amount and called it a meal. Enjoy the recipe! Peel the papaya using a vegetable peeler. Be sure to peel off the skin completely, all darker green portions of the papaya. Cut the papaya in half lengthwise and scrape out the seeds using a spoon. Shred the papaya into 2-3 inch strands using a shredding tool, mandolin or food processor. Do not shred into the core of the papaya. The membrane is bitter. Immerse the papaya in water and then rinse 2 times to remove the sticky residue. Drain and shake off the water. Use a salad spinner to remove the remaining water. If you don’t have a salad spinner, place a small amount of the papaya in a clean kitchen towel. Roll up the towel and then twist the ends of the towel in opposite directions to wring the papaya dry. Cut the beef jerky into thin strips. Smash garlic cloves using a large knife and peel off the skin. In a medium jar, add the peeled garlic, water and vinegar. Stir the solution. Cover and allow to marinate for at least 4 hours. Marinating overnight yields the best flavor. Strain the garlic, vinegar, water mixture into a medium bowl and discard the garlic cloves. Add sugar and the three different types of soy sauce . Stir until the sugar is dissolved. Add the red chilies. To serve, either toss everything together in a large bowl or plate each salad individually. Serve with the Garlic Soy Sauce Dressing. Follow the instructions above for preparing the papaya. Bring a medium pot to a rapid boil. Add salt. Put pork into boiling water. Simmer on low with the lid slightly open for 15 minutes. Pork is cooked when the internal temperature reads 160 degrees on a meat thermometer or when pricked with a knife the juices run clear. Remove pork from pot and allow to cool. Drop shrimp into hot broth and cook for just 1 minute. Remove shrimp and allow to cool. Cut pork into 1/4-inch thick slices. Then cut into thin strips. To make the dipping sauce, add all ingredients into a medium bowl. Stir until sugar is dissolved. To serve, place a generous amount of the shredded papaya on a salad plate. Add basil, pork and shrimp. Top with the crushed peanuts and serve with Fish Sauce Dipping Sauce. Hi, glad you enjoyed the recipes. The Thai version is delicious too. Your recipe sounds delicious. Do you have the name of the food processor and where you bought it? I like your recipes alot and it very easy make. Hi Mariann! Appreciate the kind words and thanks for stopping by. Happy Cooking!